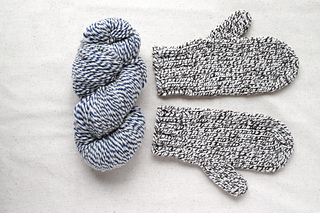 Make sure you are only using half of the yarn for each mitten. If you are getting the correct gauge and knit to the specified lengths in the pattern the yarn amount will be fine for all three sizes. As per my knit samples, and knit as written in the pattern, there should be plenty of yarn without a lot of leftovers remaining at the end. One medium-size mitten I knit as a sample weighed in at 25 grams, so 50 grams for a pair of medium-sized mittens total. 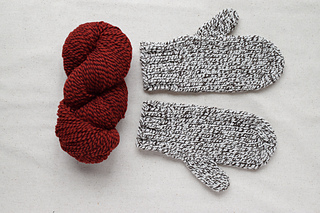 One large-size mitten weighed in at 27 grams, so 54 grams for a pair of large-sized mittens. The small size has more than enough yarn in the kit. I just wanted to give you a head’s up before you dig in. Thanks so much for the support and have fun with your mittens! 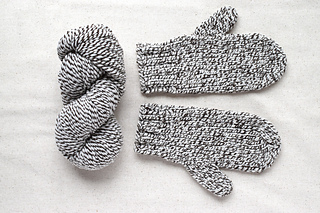 Now the beloved Waiting for Winter Mittens pattern series has a new version for bulky weight yarn. This pattern has three sizes, including child’s large/adult small, adult medium and adult large. 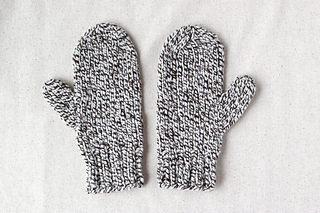 The mittens knit up lickety-split with the bulky weight yarn and larger needles. It will take you an evening or two to make a pair. You’ll have the simple pattern memorized after only a couple pair. 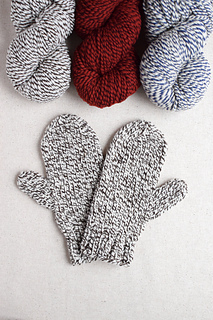 With mitten knitting season in full swing this is the perfect time for another version of Waiting for Winter Mittens! Barrett Wool Co. Wisconsin Woolen Spun Bulky Twist (100% American Wool, bulky weight 2-ply, 185 yards/114 grams), 1 skein. US size 10 or 6mm double-pointed-needles, set of four, OR size to obtain gauge. 3.5 stitches per inch in stockinette stitch and 6 rounds per inch.